Brian Goodwin Plumbing Ltd is a team operation based at 160 Totara Street, Manunui. We do a wide variety of mainly domestic plumbing and drainlaying work, consisting of new housing, renovation and maintenance work. We also install spouting, septic tanks/soakages, water pumps, solar heating, waste water systems as well as fire installations. We have a digger and truck for landscaping and any drainage jobs big or small. 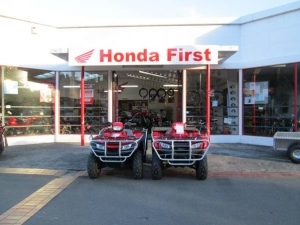 Honda Motorcycle sales, parts and service. Honda Power Products sales, parts and service. Merida Cycle sales, parts and service. Qualified mechanics for both motorcycles and cycles to meet all your needs. 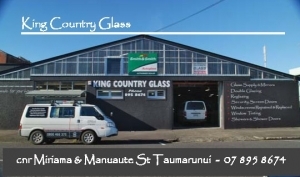 King Country Glass and Homeplus are a locally owned and operated business since 2004. We service the wider King Country area and Central Plateau regions. Kevin and Nicole and their experienced team offer a wide range of services from all your glazing requirements, double glazing, awnings wardrobes, security screens and doors as well as fly screening, wardrobes, ranchslider locks & rollers. We also do windscreen replacement and repairs and can undertake your insurance claims for you. At Taumarunui Plumbing we are “more than just a plumber”. Covering the Central North Island for over 20 years whilst delivering reliable quality services. A candy store for Tradesman, Farmers, DIY-ers and gift buyers. 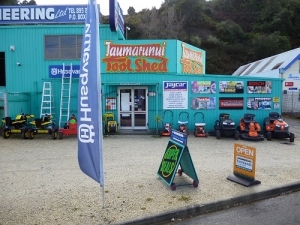 You name it we have got it, or will get it for you, including Hand Tools, Power Tools, Machinery, Chainsaws, Mowers, Gas, Engineering Supplies, Ladders and Jaycar Electronics and so much more…..
Top brands including: Jaycar, Husqvarna, Makita, DeWalt, Bosch, Hitachi, Powerbuilt, Ezi-Swap and Ullrich. Come and check us out for the best service in town.